SANIBEL, Fla — There are a lot of animal lovers in Southwest Florida, especially on Sanibel Island, where paradise is enhanced by the hundreds of different species. Now you can see more. 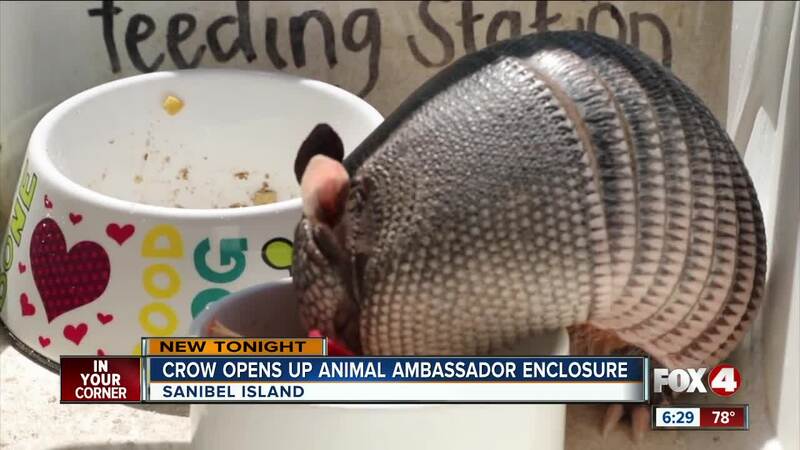 C.R.O.W., the Clinic for the Rehabilitation of Wildlife on Sanibel Island, opened up its Animal Ambassador Enclosure at a ribbon cutting Tuesday. At C.R.O.W., countless animals have come to the medical hospital from around Southwest Florida with various injuries. Many of these patients have been successfully rehabilitated and released back into the wild where they were first found wounded. There are five animals that will be the “ambassadors,” for the enclosure. There’s the Great Horned Owl, Mina; Talon, the Red tailed Hawk; Billy, the Armadillo; and Bashful, the Possum. Each of these animals were once patients at C.R.O.W being treated for injuries. Clinic officials day the ambassador enclosure is going to serve as a permanent home the animals, but they’ll be teaching tools for the public.